A mysterious black box has fallen to Earth that could let you see your utmost desires be it money, love or something else. While this would seem a gift to some it soon becomes apparent that the box is more of a curse as a man comes looking for the box with one thing on his mind, to kill the new owners of the box and recover what is his. 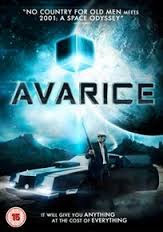 Written and directed by Matthew Schilling you would think that would allow 'AVARICE' to be put together well unfortunately we are left with an incoherent mess. Now the whole idea of something that reveals your desires is nothing new but with this Schilling went the sci-fi angle having Kevin Sorbo play a immortal assassin that just wants the box. Aside from him playing the assassin he has no lines throughout apart from the opening and closing narrative. The plot is pretty thin on the ground and having the box just go between the cast just came across as a painting by numbers script idea. Many questions are left unanswered such as, where did the box come from? Why is Jason London's character and another character together in a suicide pact? Why is the assassin after the box so badly? The idea behind the script is decent enough but fails short of what is promised as the film just seems to drag on and without much payoff towards the end. Through all of its bad points though it does have a good cast in Kevin Sorbo ('HERCULES'), Brad Dourif ('CHILDS PLAY') and Jason London ('DAZED AND CONFUSED'). Not one to come back to again and again unless you like slow paced sci-fi fare with little plot direction.